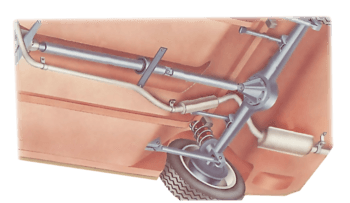 Many hinges are welded to the car bodywork and cannot be adjusted or renewed. But if a door or a boot or bonnet lid becomes slack and badly fitting, the cause may be a worn hinge pin which can be renewed. Worn hinge pins occur most often on front doors, where the hinges get the most use. Hinges that are bolted to the bodywork can be adjusted (See Adjusting catches and hinges). If they are badly worn, the hinge pin can often be renewed, or alternatively the whole hinge renewed. It is usually simpler to renew a pin than a hinge. Solid pins with projecting heads can often be levered out with a screwdriver inserted under the head of the pin. Ask a helper to hold the door open, supporting it underneath. Use a padded support such as an axle stand as well; if the door drops, a hinge may be distorted. Some hinge pins are solid, but many are hollow with plastic caps. You may be able to tap out a solid pin with a hammer and drift. Use the oiled new pin as a drift, driving it in as you force the old one out. But on some cars it is difficult to use a hammer and drift without damaging the bodywork. If a pin has a projecting head, lever under the head with a screwdriver and tap out the pin using a rawhide hammer on the screwdriver shaft. You may be able to remove a hollow pin by tapping it out with a drift of the same diameter as the pin. Oil the outside of the new pin before you tap it in, using the same drift. Alternatively, hire a special tool — a hinge-pin remover and replacer. Remove the pin cap and thread the tool into the pin shaft. When it is through, screw on the tool cap and tap the handle with a hammer to withdraw the pin. It is usually easiest to withdraw a top hinge pin downwards and a bottom hinge pin upwards. To insert a new pin, oil the outside of the shaft, thread it on to the tool and ease it into the hinge, tapping the handle with a hammer. To avoid distorting hinges, support the door with a padded axle stand. Wind the window shut and remove the door fittings and trim panel (See Removing a door trim panel). Disconnect the door check strap or restrainer. Some have a pivot pin that can be tapped out with a hammer and punch. On others the pin is held by a clip at the bottom; prise the clip off with a screwdriver and lift out the pin. A door check strap (restrainer) is often held with a pivot pin. Release the strap by tapping out the pin with a hammer and punch. Uncover the hinge fixings inside the door pillar. You may have to remove floor covering or side trim to reach them. Ask a helper to support the open door at the bottom. Use a padded support such as an axle stand under the door to make sure your helper does not lower the door too much on one hinge and distort the mountings. With the door restrainer removed, you may have sufficient room to get at all the hinge bolts. If not, undo those on the door pillar and take off the door. To undo cross-slot hinge bolts you may need to use an impact screwdriver. Bolts may have hexagon heads or cross-slot heads, and will be tight. Undo them with a socket and bar or large cross-head screwdriver and self-locking grips; alternatively use an impact driver. Undo the lower hinge first, then slacken the bolts on the top hinge. Ask your helper to lift the rear bottom corner of the door while you take off the bottom hinge. Have the door lowered back into place while you fit the new hinge. On some cars you can reach the bolts on the door side of the hinge with a socket and bar, after removing all or part of the trim. Oil the bolt holes, then place the new hinge so that its outline fits into the marks of the old hinge. Half tighten the bolts on the bottom hinge while you remove and fit the top one. Make sure the door is properly positioned before you tighten all the bolts. 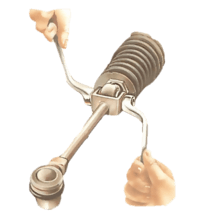 On cars that have hinge springs, make sure the spring does no push the door out of line as you take off the hinge. Check the door alignment and closing action. 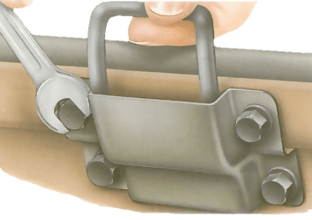 If necessary, adjust the hinges and the door-lock striker plate (See Adjusting catches and hinges).